At the end of the week I’m always excited to get home, do nothing and cool off with a glass of wine. Recently I’ve gotten into an experimental phase with my drinks. I made an excellent batch of sangria (using every fruit imaginable), played around with a Moscow Mule recipe and most recently, instead of going summer tropical- I went British garden party-style with Pimm’s Cup. Pimm’s Cup, the perfect summer drink! It’s refreshing without being too sweet and is made mainly with Pimm’s No. 1, a spicy yet sweet British booze that looks more like iced tea than a delicious summer cocktail. The alcohol content isn’t as high as other drinks, so it’s a safe drink to have more than one of. The refreshing drink is a gin-based liqueur named after the bar owner who created it in the mid 1800s, James Pimm, and it took me a long time to find in the liquor store. I made the recipe with ginger ale, but it can also be mixed with lemon-lime soda or lemonade. Apparently lemon Pellegrino is the best ingredient we can get in the US to make it most like the British-version, but I love the spice of ginger ale. 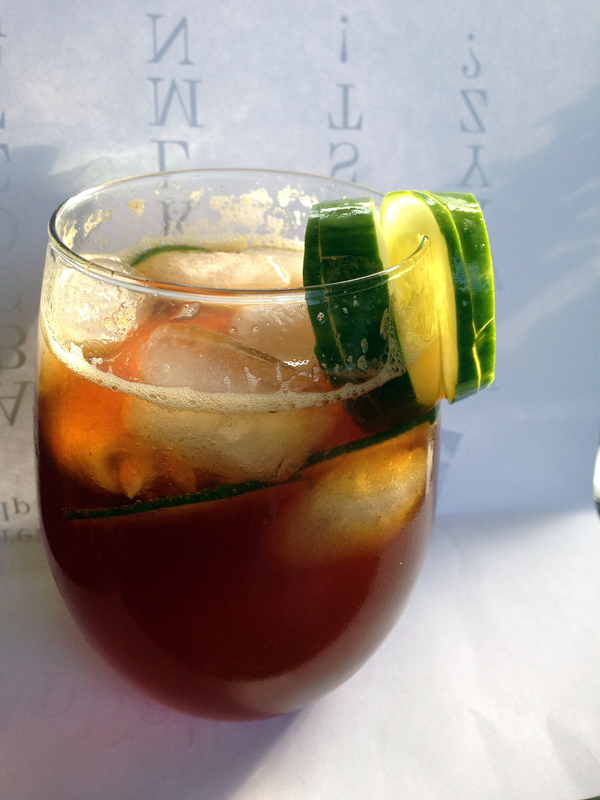 Pour the Pimm’s into a tall glass with ice cubes, add the ginger ale or other preferred mixer. Add the lemon and cucumber and don’t forget the mint… drink! I sliced the lemon in half and squeezed one half into the drink and added the other half, sliced, in the finished cocktail. You can never have too much lemon! My next Pimm’s experiment is going to be a “Pimm’s Royal,” by substituting the ginger ale for champagne. Num!